To contact The Expendable Project, please use the box below. If the message is confidential, and not for posting in the public domain, please state this. Media enquiries can also use the same address, but please note that all such communication will be managed by the network of gatekeepers, for the reasons described in the Expendable Statement Of Operation. They bring all their darkness in a light known as Shapelle Corby, they are attemping the impossible that is, to put her off. LETS ORGANISE A NATIONAL DAY NEXT MONTH OF NON COOPERATION WHERE WE ALL STAY HOME, DONT GO TO WORK, DONT SPEND ANY MONEY AND WE WILL SHOW OUR REAL POWER TO THESE PSYCHOTIC GOVERNMENT CRIMINALS. ON THAT DAY WE WILL CALL AND EMAIL AFP AND ABC, AND GRAFFITI THE WHOLE COUNTRY WITH "FREE SCHAPELLE" ETC. MILLIONS OF US WILL BE INVOLVED. 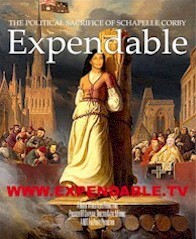 WE NEED EXPENDABLE.TV TO ORGANISE/PUBLICISE THIS DATE. WATCH THE MOVIE "GHANDI" FOR MORE INFORMATION. HANG ON SCHAPELLE, WE'RE GONNA FREE YOU SOON. Hi! I would like to burn a many copies of the DVD and distribute them. How can I download this file as a DVD? We strongly encourage the download and distribution of the film. Thank you very much for assisting. There is plenty of evidence of David Eastman's innocence but falls on deaf ears. What will make the judicial system listen to innocent people. I am glad I don't live in Australia!! Definitely not a one off. Crikey, the big one was the Port Arthur Massacre. If the Government can get away with that one, then what chance does a single individual have. People of Australia - wake up! The only hope for a second chance you have for salvation comes through me Jesus Christ. Ive come to judge the very people who have judged and convicted you. "Let those who are without sin cast the very first stone." "Only true fools get themselves into positions where they spend each and every day thinking up and carrying out stupid things to do to other people therby which they only rack up conviction after conviction upon themselves all of which will are going to be fully paid back to themselves. "While professing to be wise they actually became fools"
John Howard, Kevin Rudd, Julia Gillard,. Its a real shame. These leaders have got all the advisors they can possibly find at their hands and in all honsty there is not one wise one amonst them. Other than helping to distribute this film, is there any organized strategic effort we can contribute to? Any forum dedicated to support of this project or Schapelle? From there, other initiatives will become apparent. There is also an email news and alert list, which you can join via that group. Please point me to the documentation where it states Schapelle's luggage changed weight after check in at Brisbane and its arrival in Sydney. I have always believed Schapelle to be innocent but would like confirmation of the weight change. Sweet innocent girl, never for one moment have I ever believed you were guilty. I am speechless as to what to say to the people who really think she is guilty and I know lots of them -Fools. Disgusting media. Brain washed, heartless, senseless people. It is clearly visible to those who wish to look, that this girl is where she shouldn't be. We are not separate, there is no humanity here. "Please point me to the documentation where it states Schapelle's luggage changed weight after check in at Brisbane and its arrival in Sydney"
It is possible to organize via facebook and twitter some form of non violent internet strike in support of Schapelle, like for example a day with the light switch off for Schapelle or better a day with all television switched off? Eamonn Duff is making a fortune from his book Sins of the Father, I know quite a few people who have read it and believe it. It has some excellent reviews on Amazon, people believe its the truth. It really annoys me that Duff is making money from lies, yet Schapelle's money was confiscated when she needed it the most. I feel the cover of the book should be more prominent, and it's difficult to find (amongst all this information). Maybe put a graphic across it saying LIES Just a thought. Fantastic work! You replied to my message above with the link to the transit report - thank you I got it. "It is possible to organize via facebook and twitter some form of non violent internet strike in support of Schapelle"
The best place to head to is 'People For Schapelle' on Facebook. They are in the early stages of organizing a number of protests and initiatives. As I understand it, the weight change happened after the Boogie board bag arrived in Bali? but this would mean the drugs came from Bali and well known Indonesian corruption planted the slashed open bag of pot. Of course Australia's mates the Indonesian Military Dictatorship would never do that now would they? "As I understand it, the weight change happened after the Boogie board bag arrived in Bali?" No, that isn't the case. The weight was recorded on the Qantas system. In other words, in Australia. This is confirmed by correspondence revealed in The Transit Report (http://www.expendable.tv/2011/09/transit-report.html). http://www.icac.nsw.gov.au/ Maybe we should all send as much info about it here, to the independant Commission Against Corruption!! We need to get her home!! I would like to be able to send a copy of the transit report to my local MP .I was having trouble printing it with my computer.I think a copy of the transit report needs to handed directly to the Attorney General from a Queens Council.Any ideas. if i was ever set up here in Australia or overseas i would be proud and so happy if Hidden World Films fought for me like they are for Innocent Schapelle. You People are amazing and i respect you all so much. I do alot of promoting and supporting for Schapelle myself on her page but i just wanted to say "You guys are amazing". You all deserve a huge praise. Could you guys give us an update on proceedings with The ICC is there anyway we here in Australia can bring this matter to an International level as i have worked and seen first hand how our system covers up these matters there is no organization which is not connected in some way to Government and i believe as many do here that they (The Commonwealth Government along with the AFP) are complicit in this conspiracy against the Corby Family. It is blatantly obvious the reasons why Schappelle is taking the fall, if an investigation into the Airports or the AFP or any Government Department where to take place,this would expose Major Corruption from the Top Down. I just want to say HWF you have done an amazing job, full credit to you guys and gals i will do my best from here to bring this to the public in any form i can..all the best! Yes, cases are being put together for international submission, as the complicity across departments is fully established. Thanks for your own efforts and support. Together we will prevail. How does one donate to support your efforts? "How does one donate to support your efforts?" What is the best address to send Schapelle a care package for Xmas??? Melanie, The best place to pose this question is the People For Schapelle Facebook Group. There will certainly be people on there who can help, and who will welcome you warmly. Just search on the name on Facebook and you will find it. Sending letters is effective, so is definitely worth pursuing. Thank you. How do i download the full movie? The links are near to the foot of that page. Alternatively, it can be downloaded directly from YouTube. I have never been so disgusted as I am after watching this.... the government has a lot to answer for I knew from day dot Schapelle was innocent I remember screaming at the tv saying noo she is innocent. I knew there was cover up But to this extent!!! wow ... I will NEVER stop believing in you schapelle, my heart goes out to your mom and family. I posted many times on my fb that she was innocent free her but that just does not seem enough, ive posted the link to this and will do repeatedly attaching it to our local radio station asking them to please watch and discuss.. I want to do more... please what can I do to help????.... this IS SO!!! unjust it's gross negligence for our government then and NOW!!! Gross Negligence on behalf of the AFP ... my sympathies go to the young policeman that blew the whistle to who was murdered and this was covered up as well.. how many more people will be left to rot such as schapelle or jailed or murdered before someone does something to set this wrong right??? With respect to the Corby case, it is good to remember that the most fundamental task of any government is to protect its citizens. When a governmnet actively attacks and destroys a citizen, then it is clear that it no longer has a mandate to rule. The rule of law is based on the fact that one is innocent until proven guilty. On both counts then we are ruled by unprincipalled thugs who believe that might is right and that the common man (woman) is merely a unit of production and a chattel. I hope that some of us are now starting to think and to talk and that Schapelle's jailing will start such a wave of protest and anger as will sweep the rot away and forever change the political climate in this sorry country.. I was disgusted to read that Andrew Bolt on his blog today, is calling for a boycott of the Michael Willesee, Schapelle interview. This man is a hypocrite, he goes on about the right of individuals to have the freedom of speech, yet he suggests that readers of the "Herald Sun" should boycott the interview. Someone should have a good look at what this man has written, and saying on the radio station 2GB Sydney, Steve Price and Andrew Bolt. Give Schapelle a break, she has just got out of jail. It's just so unfair that bullies like Andrew Bolt can get away with writing and speaking such ill informed, biased rubbish. Schapelle has a right to tell her story, Andrew Bolt has no right to be little her and her family. Truly inspired -gutsy work. If the "mainstream" media could produce journalism with this integrity, perhaps, their ratings would stop collapsing. I would love to see a broadening of the thesis for motive - surely if the government and its minions are capable of this depravity-level corruption during office hours it begs the question of how deviant are they after-hours? It seems to me that the totality of this mission to shaft Schapelle points to a larger and more insidious motive. Have the Expendable Crew considered links to human-trafficking, black budget activities etc. Is anybody else concerned that the story of Schapelle's mental state makes it easier for sinister elites, who probably dread the thought of her return, to kill her and make it look like suicide.